The drumbeat started plaintively at dusk. I felt someone tap me on the shoulder. 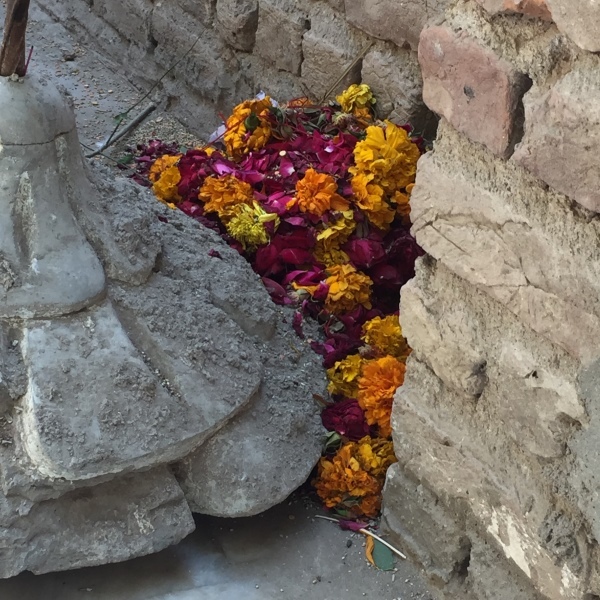 As I turned around, the sights were to behold – orange, purple, yellow, green and blue fairy lights adorned the tomb, creating a riot of colours. The chadors (cloth) being handed out for draping around our necks were lal (red), the colour attributed to the Saint. It wasn’t just the sights and sounds that were captivating; incense sticks generated a pleasant aroma. Typically, I would’ve been irritated by the cloying Metro Milan agarbati (incense), but not this time. The nasal senses were heightened as much as the others, if not more. As if the sights, sounds and scents weren’t enough, a tingling sensation was felt, all the way from my fingers and toes to my centre. It felt like a warm embrace. 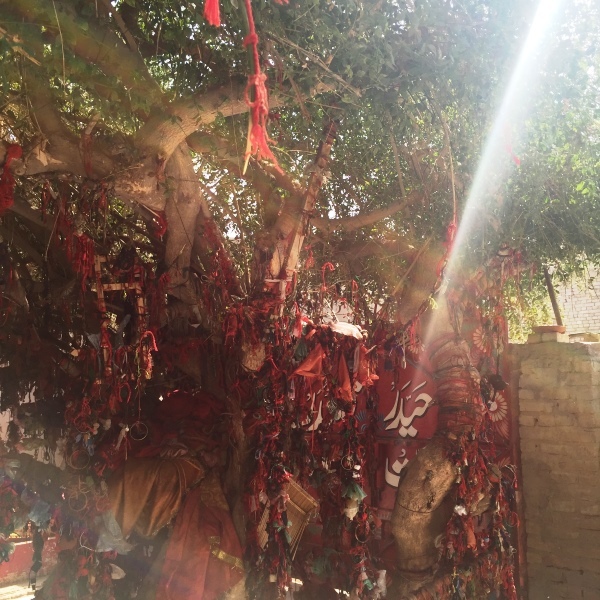 Shrine Courtyard, the giving tree where people have tied colourful threads during their visit. Shrine courtyard, flowers stuck behind concrete. The drums continued in the same monotone, louder, but not monotonous at all. There was something new to be experienced this time; the beats echoed in my blood stream. 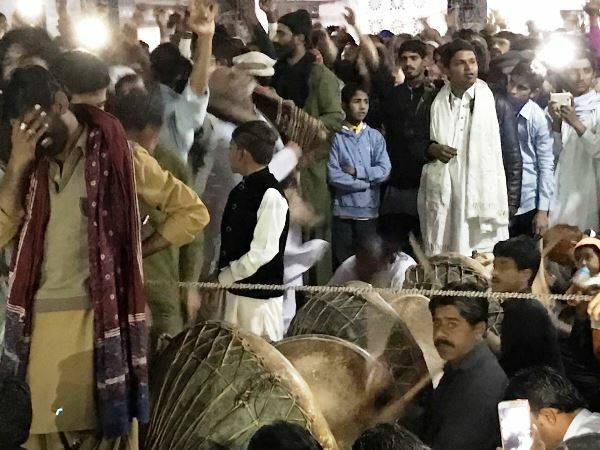 Could it be that one could actually feel the drumbeats in their blood? Perhaps the sound resonated with the plasma and cells circulating in my blood. I could feel the beats reverberate in my bones, joints and muscles now; nudging me to act and not just sit there passively. I was mesmerised by what I saw, smelt, heard and, above all, felt. With all kinds of sensory overload, the urge was upon me to sway; to twirl alongside the devotees gyrating to the drums. Yet, I sat there as if glued to the spot. It was then I realised that I was content in just being an itinerant observer. Sitting out the moment, in and of itself, was sufficient. I felt my head sway from side to side, involuntarily perhaps, to the beat. By then, my body too had settled to the rhythmicity of the drums. Without much fanfare, a shehnai (flute) piped in. Although an instrument of celebration, the notes that emanated were melancholic. The musical ensemble thus created further tugged at the heartstrings. 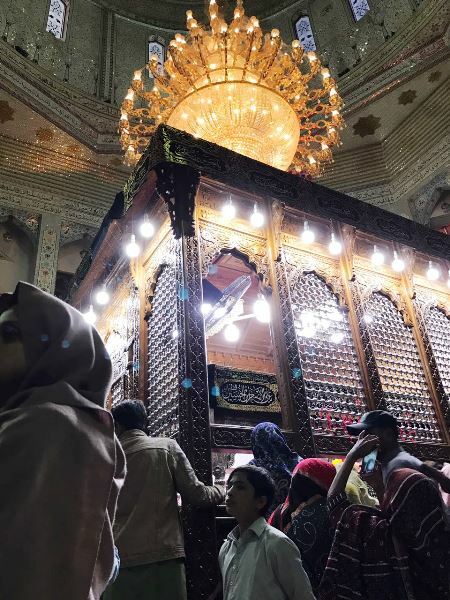 Overwhelmed by it all, I shut my eyes and just focused on the sounds at the shrine. In that trance, time was suspended; I must have been in that state for almost an hour without realising it. But then there was no need to monitor time as we know it. And before I knew it, the music had died down as unobtrusively as it had started. The whirling came to a standstill. My intoxicated fellow travellers returned to this world, their temporary abode. Like me, had others been transported to that place elsewhere? Was this subliminal ecstasy? I wondered, because the colours and fragrances were simply too bold and intense to be reckoned with in a normal state. Had I consumed something? Maybe the oxygen at the shrine was different? The reality, though, was more mundane. I hadn’t ingested or breathed anything unique to help transport me. I think I did not need anything in ‘the system’ for the experience to be had. I was primed for it. I had no expectations of this dhamal – the trance-like dance of the dervishes – that had been practiced at the shrine since the 13th century. That night was no different, but for me the dance was transformative, like none before. 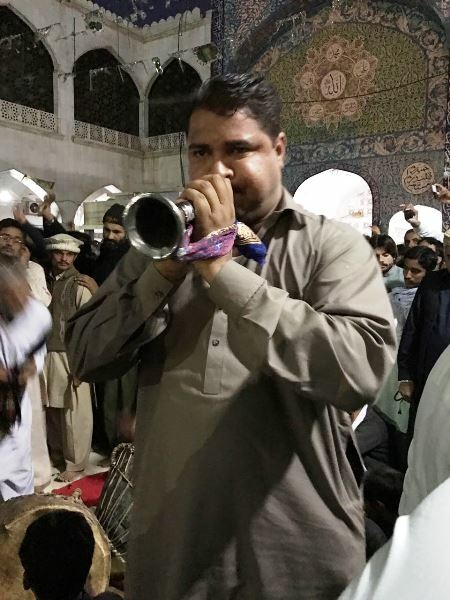 My memorable trip to Sehwan Sharif was almost a year back. It occurred a week before the suicide bombing there that took the lives of 72 innocent men, women and children, and injured over 200. Meaningful questions or self-serving thoughts? I think the real question was whether I would ever go back? 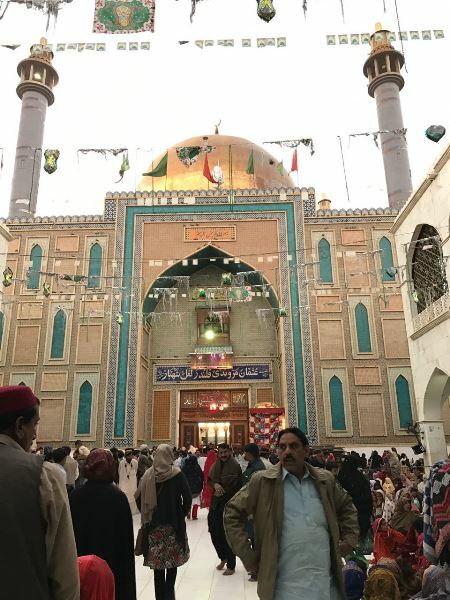 The suicide bombing at Sehwan Sharif was yet another attack on Sufi culture – a culture I believe is intimately linked to the Pakistani ethos. 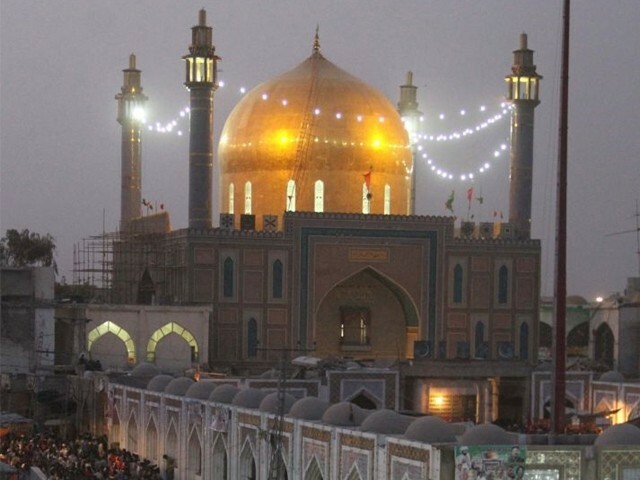 Regardless of my spiritual experience at the shrine a year back, I fear extremism will ensure things don’t remain the same. It would be rather difficult for people to go to such places without fearing for their life and that unfortunately, may prevent them from going at all. I hope though that I’m proven wrong and this culture does not die down. The author is an ER physician and a writer/blogger/innovator whenever he's off. 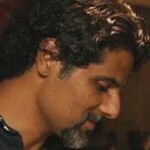 He is also an Associate Professor at the Aga Khan University. Other than the Biloongra series of bilingual books for children, he has written An Itinerant Observer, published in the US. He can be reached on Twitter @amian74 and his blog (anitinerantobserver.blogspot.com). A timeless trip to the Mediterranean: How can an ocean have no memory?